I received this utterly cute award from dear Jen. Thank you Jen. That was very kind of you. 3. Tell something about yourself that you haven’t told anyone on your blog yet. 4. 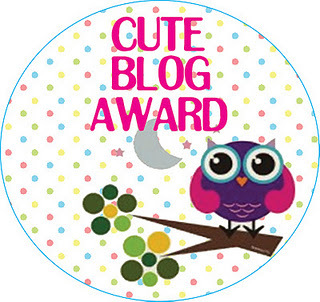 Award as many blogs as you think are worthy of this award. I hardly wear make-up. I never wear it in my daily life, only when I’m going out partying / going to birthdays. Fashion trend of 2011? I have no clue! I’m not into fashion and trends. I wear whatever feels comfy and what fits me. I’ve never cared about what’s in or out. Chocolate cake or cinnamon buns. It’s hard to decide because they’re both so friggen yummy! If I can have both I’m happy ;) Oh wait, I also love waffles. Mmmmm. Seems like I can’t choose…. That varies. When I was younger it was blue. Now it’s def. green. I like most shades of green. Elisabeth. Got it from my mum; her middle name is also Elisabeth. I never use my middle name though. That so is such a beautiful song. One of the best songs from his new album, that is officially out on 6th of March. Someone is very excited! Cats! Cats! Cats! I’m def. a cat person. Myfirst cat was named Pelle. I had him for 12 years (minus 1,5 years when he was missing) and was the greateast cat ever lived! Now I have a cat living with my parents. He’s name is Samson and is a very, very cute and loving cat. So… I’m going to tell something about myself I haven’t shared on this blog. I have two thin steel bars in my back. They are each 30 cm long. When I was young my back was crocked. I had a form of scoliosis. My back was shaped like an S. Originally I was going to wear a back brace (looks a bit like a corset) for a year to straighten me up, but after trying the back brace they found out it wouldn’t work. So in stead I had a back surgery. I was 13 at the time. They cut open my back and placed two steel bars in my back in addition to a bone that they took from my hip. So I got a 30 cm scar on my back and a small one on my hip. Karin Elizabeth: her blog is a great inspiration and her photos are always so lovely. Jasmine / The Daily Frolic: Jasmine lets me, by reading her blog, tag along on some great adventures. These adventures are documented by awesome photos. Also, holy wow, that sounds like a major back operation!